Put the sliced potatoes in a bowl and add olive oil, salt, half the pepper and the parmesan cheese. Mix it all together (using your hands is easiest) to coat the potato slices evenly. Lay out the slices in a pie dish, starting from the middle and working out, making sure the slices overlap and that there are no gaps. line the edge of the dish with overlapping slices as well. Meanwhile, cook the bacon in a pan until just crisp. 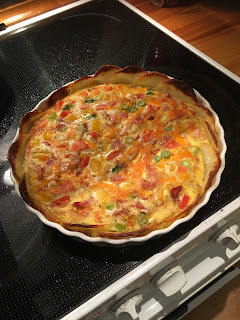 Transfer to a bowl (I just used the same one as before to save on dish washing :-P ) and mix together with the eggs, milk, green onions, bell pepper, tomatoes and cheese. Add the rest of the pepper and the garlic powder. Slowly pour the mixture over the potatoes, making sure they don't start to life up. Bake for 30 minutes - leave to rest for another 5-10 minutes before serving. Really good! I like alternative uses of potatoes, and this was a great addition to my repertoire. Definitely something I'll be making again, and it's so easily adaptable too - just the way I like it.